Americans crack me up. Retailers spend 6 months prior to December to stocking their stores with every Champagne and Sparkling Wine for that one day of the year that Americans go bonkers for these wines. Even if they hate sparkling wines, they feel it is obligatory to ring in the New Year with a toast of something bubbly. I am here to tell you that Sparkling Wines, (AND I WILL CLARIFY THIS FOR THE LAST TIME….EVEN IF IT COMES FROM FRANCE AND HAS BUBBLES IF IT IS NOT MADE IN THE REGION OF CHAMPAGNE IN FRANCE IT IS NOT AND I REPEAT NOT A CHAMPAGNE IT IS A SPARKLING WINE. CALIFORNIA CHAMPAGNE IS EQUIVALENT TO SAYING YOU LIVE IN LOS ANGELES FRANCE) are not just for New Year’s Eve or in the Locker Room when A Baseball Team Pours this stuff on their teammates to celebrate the winning of the World Series. Sparkling wines should be worked into your regular regime of enjoying wine. They are Wines except with Bubbles. They are versatile for Apertifs before dinner, they are very food friendly and the ones that are a little sweet are great with fresh fruit or desserts. I wanted to give you some options to look for that are very very affordable Sparkling Wines from all over the world that you should be enjoying more often than once per year. Collalto Prosecco comes from The Princess Isabella Collalto and it is one of the few Prosecco Superiores on the market, one of the few vintage Proseccos and it is one of the very few made in the “Extra Dry” form which believe it or not is slightly LESS dry than a Brut. At $15 this is a great glass of sparkling wine. Last but certainly not least. I have always been in love with Franciacorta. This is one of the few regions in Italy that makes sparkling wines in Methode Classico or in the Method Of Champagne with the secondary fermentation taking place in the bottle you are drinking from . This is a DOCG Controlled area near the Lombardia Region of Italy and the wines must contain the 3 grapes of Chardonnay, Pinot Nero, and Pinot Bianco. Very few expert palates can tell the difference between a Franciacorta and the Real Deal Champagnes. 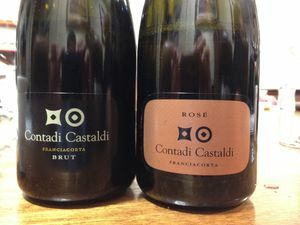 I personally like Contadi Castaldi from the Terra Moretti family because they are delicious and very affordable and are almost as good as any French Champagne on the market at 1/3 the price. Try The Brut Or Brut Rose and search for them at local retailers. You will be very surprised with the Quality To Price Ratio. In Summation, I hope wine lovers will branch out from just popping the corks for Celebrating the New Year, Anniversaries, Birth Of A Baby, World Series or Superbowl Championships. At these prices you can CELEBRATE LIFE on a Regular Basis with BUBBLES!! CHEERS!!!! PreviousThe Search Is Over For That Perfect Glass Of Wine!